Mirza Ghulam A. Qadiani, the founder of Ahmadiyya Movement, the self proclaimed Messiah and Mahdi, boasted of excellent conduct and claimed to be a perfect replica of Holy Prophet Muhammad SAAW. He even went to the extent of claiming that the verse 'Wa maa arsalnaaka illa Rehmatal lil aalameen' had been revealed glorifying Mirza. Al-Quran 21:107 - "We have not sent you (O Muhammad) save as a Mercy for All the worlds." However a close scrutiny of his life how cruel this so-called 'Prophet/Messiah/Mahdi' was. 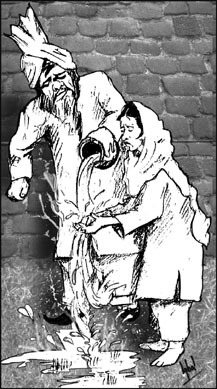 "My lady, that mother of Aziz Muzaffer Ahmad, narrated to me that Hazrat Maseeh Mowood usually used warm water for to clean himself in the toilet and did not use cold water. One day he asked some maid to keep LOTA in the toilet. By mistake she kept a LOTA of hot water(!!!) After finishing when Hazrat Maseeh Mowood came out, he asked who had kept this LOTA. When he was informed that a certain maid had kept it, he called her and asked her to stretch her hand and then he poured all the remaining (HOT) water on her hands, so that she will realize that such hot water cannot be used for cleaning (the pakhana - faeces). He did not say anything else to her." Is this the character of a PROPHET, a person who claims that God has told him that he is the mercy for all mankind? Ethics and Morality of Mirza Ghulam Ahmad Qadiani and Co.